The historic substance of the former main accomodation was handled with greatest care. Wall decorations of the camp time were partly uncovered. A slate altar in the centre of the building creates a place to reminisce and commemorate. 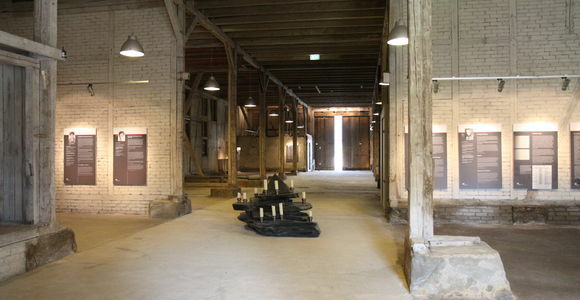 The main focus of the exhibition is the fate of the inmates. It is subdivided into three sections: deportation, forced labour, and daily life in the camp. Typical experiences of prisoners are shown as they have been described by survivors. Descriptions of the daily routines in the camp allow a deep insight into the inhumane treatment of prisoners. Lack of food, forced labour, inadequate clothing and poor hygienic conditions lead to a dramatic increase in casualties among the prisoners in winter 1943/44. The death of comrades was part of daily life. The history of the memorial site is another aspect of the exhibition. It is located on the brick wall that used to separate the memorial and the barn in the past. At the south-western room for the Kapos two biographies of these prisoner guards are shown: Alfons Kunikowski and Lorenz Nocker. At the north-western room are the examplary biographies of perpetrators: camp commander Wolfgang Plaul, guard Ewald Pökelmann and civil employee Erich Roth. Few exhibits - a V2 rocket engine, personal belongings of prisoners and a machine from the quarry - complete the exhibition.